As Houston ISD took over the management of the Disciplinary Alternative Education Program (DAEP) – a school for students most at risk of dropping out, many with a history of disruptive behaviors – school officials built Communities In Schools’ intensive student support into the school’s design. “All most people see when they look at students at the DAEP is the armor, the attitudes, the chips on their shoulders,” said Lindsay Head, licensed therapist for CIS at DAEP. Head works one-on-one with students and their families during their stay at the DAEP to help them identify and understand the root causes of disruptive behaviors and give them a second chance. 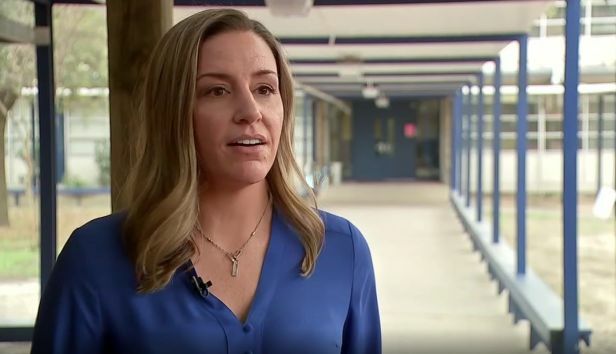 She applies more than a decade of experience in mental health to help build up students’ confidence and coping skills to manage emotions and behavior when they feel threatened. She works with them to set up resources and create a game plan for success as part of HISD’s efforts to personalize the educational experience for every child in a nurturing and safe environment. With CIS student support specialists in schools across Houston ISD, Head works with counterparts at those middle and high schools to provide a smoother DAEP transition process for students. In their 45 days at the DAEP, students learn they can trust and talk to Head, and she then connects them with the CIS representative on their home campus so they have that same trust and support when they return. Together, they can check in on students regularly and help address common barriers to food, housing and other critical needs.